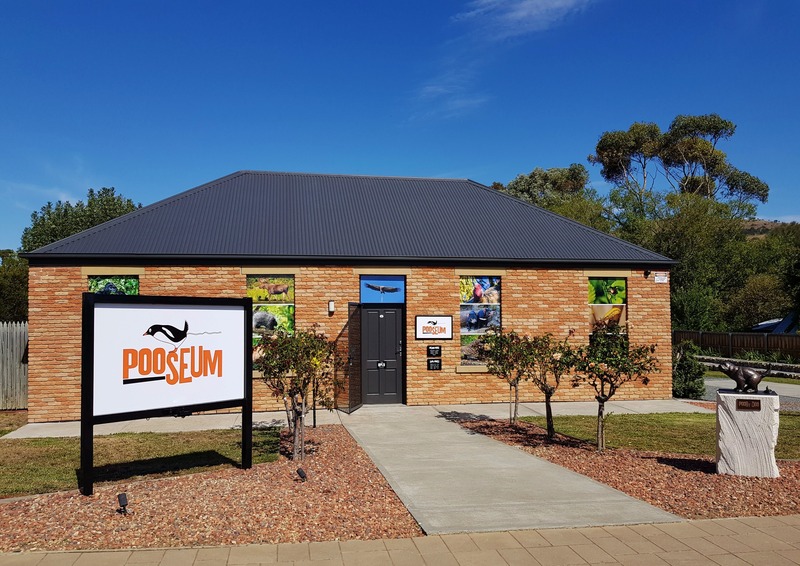 The Pooseum, the first science museum dedicated solely to animal scats, has a strong educational focus, displaying 12 large information panels, 32 smaller panels on a wide range of specific topics, and three screens with educational videos on topics such as how electricity can be produced from dung, and how collecting the droppings of endangered animals helps protect their habitat. In the Digestion Room visitors can learn about the digestive system of carnivores, herbivores and omnivores. A large touch screen shows 3D models of the digestive tracts of 10 different animals. Exhibits include fossilised dinosaur poo (coprolites), the skulls of a Siberian tiger and a kangaroo, and a photo book with pictures of scats of animals from around the world. A large display with real scats of Australian animals gives visitors the opportunity to guess which animals dropped them. The museum offers a one-of-a-kind experience where visitors can learn about the work of veterinarians, biologists and ecologists, scientists who are working on ways to make use of animal poo in areas such as energy production and medicine, and paleo-scatologists who study fossilised poo to find clues about prehistoric animals. Translations of all information are available in both Chinese and Japanese.